"Bill's dead and, uh, I'm afraid the police think I killed him." A hook like this is sure to compel fans of cozy mysteries to continue reading. Sarah Blair receives a phone call in the middle of the night from her twin sister, Emily Johnson. She begs Sarah to come to the Civic Center as soon as possible where she discovered Sarah's ex-husband allegedly poisoned by Emily's famous rhubarb crisp. Before rushing to Emily's side, Sarah calls her attorney boss, Harlan Endicott, asking for his help. Upon arrival, Sarah finds Emily seated at a table with a look of abject horror on her face. What was she doing there with Bill, whom by her remarks at Sarah's and his divorce hearing purported her hatred of him? Emily moved back in her Wheaton, Alabama, hometown after being offered a position by Chef Marcus who she worked with in San Francisco, to cook at Southwind, an upscale restaurant. She also returned to support Sarah when her ten-year marriage broke up. So now, Emily is at the Civic Center where a Food Expo they are to host is to be held, a fair Emily has prepared diligently for. Sarah, now happily ensconced in her tiny studio apartment is pleased to be single again, though all she received in the dissolution of her marriage from her well-to-do ex-husband was his aunt's Siamese cat, RahRah. She received custody of the beloved feline after the aunt's death and to Sarah, a bequest better than anything. Something weird is happening, and Emily's reticence with what she knows confuses Sarah. She can't understand why Emily would meet Bill in the wee hours. What is more confusing is how anyone could think Emily would kill him. She is just not capable of murder. The twins are as different as night and day as Sarah is totally inept in culinary matters, yet Emily hires her to help up at the Expo. This way, they both can keep watch on others and do some sleuthing to try to put the puzzle pieces together regarding Bill's death. Then Emily stumbles upon her colleague Richard, with a knife in his back and is taken in for questioning by police Chief Peter Mueller. Things keep getting worse. . . .
"The evidence Peter has looks bad. Maybe it won't justify a finding of premeditated murder in Richard's case, but between the fingerprints on the weapons and the blood and rhubarb all over your sister and her clothing, and Richard and Bill apparently having enough dirt on Emily to get her kicked out to Southwind and maybe even the cooking field, Peter had good reason to arrest Emily." Sarah soon learns that Jane, Bill's latest "floozy" who is in competition with Emily for the promotion to sous chef inherits everything of Bill's, including RahRah! And it is uncovered Bill became a partner of the business with Chef Marcus who was dealing with financial woes. Though Emily is endorsed for the new position, Sarah cannot picture Emily working for Jane. No, not only must Sarah deal with clearing her sister, but she needs to keep RahRah in her possession, knowing Jane doesn't give a fig about the feline and only wants the money left to care for him. Many are suspect in the killings. Jane can gain a lot from Bill's death—not only all his assets, but part ownership of the eatery as well as RahRah whom she doesn't want, but wants to be spiteful toward Sarah. Chef Marcus and Bill weren't actually on friendly terms, and the employees may have problems with him, too. Then there's Richard. Could he have killed Bill, and what did he know that would cause his death? Someone is out to frame Emily, and Sarah is determined to clear her name at all costs. With plenty having motives for both deaths, it is difficult to discern the perpetrator(s); however, the actual architect of the whole scenario comes as a complete surprise. 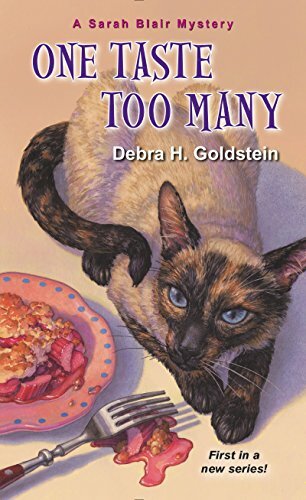 One Taste Too Many, the first edition of the Sarah Blair Mystery series, is sure to whet the appetites of whodunit lovers. Set with colorful and charming characters, the plot offers a bit of humor as the twins face challenges they never expected. The author also graciously includes two recipes for her readers to enjoy.